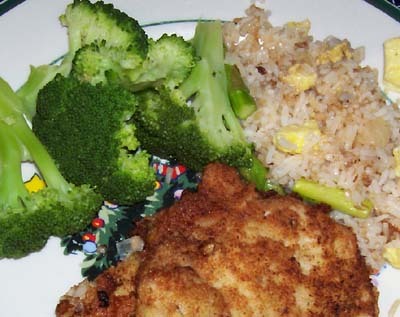 Here’s another simple and fast weekday meal which is a step better than the usual pork chop. This recipe uses pork loin cut into cutlets. This cut has less fat and cooks much faster than the bone-in chop variety. This whole meal can be prepared in less than an hour. What I do to save time is to wash and cut up the pork loin prior to freezing so that it’s ready to just batter and fry up when dinner time comes. Paired with garlic fried rice made from left over rice and steamed broccoli and you have another quick, easy and nutritious meal. To make the fried pork loin, simply moisten the cutlets in beaten egg, dredge in bread crumbs seasoned with garlic powder, salt, pepper and dried basil; and pan-fry until they are golden brown. Very simple! can i come over and eat? Yum, yum, yum! And only a mother would know how to plan/execute meals that are quick and easy to make. Not to mention also TASTY!